-Identify the track. What features helped you to identify the track? The Indianapolis Speedway. Identified by the brick track and the distinctive grandstands. -What month and year was this photograph taken? Unknown, but possibly September 1910 practicing on the Indy 500 track prior to the 1910 Vanderbilt Cup Race. See Greg Oreiro's comment below. Congrats to Greg Oriero, Steve Lucas and Ariegan Bos for identifying the Alco Black Beast at the Indy track. Special kudos to Greg for raising a possible reason why the Alco has the #18 on its hood at the Indy track. Harry Grant and Frank Lee in front of the Indy 500 grandstands. 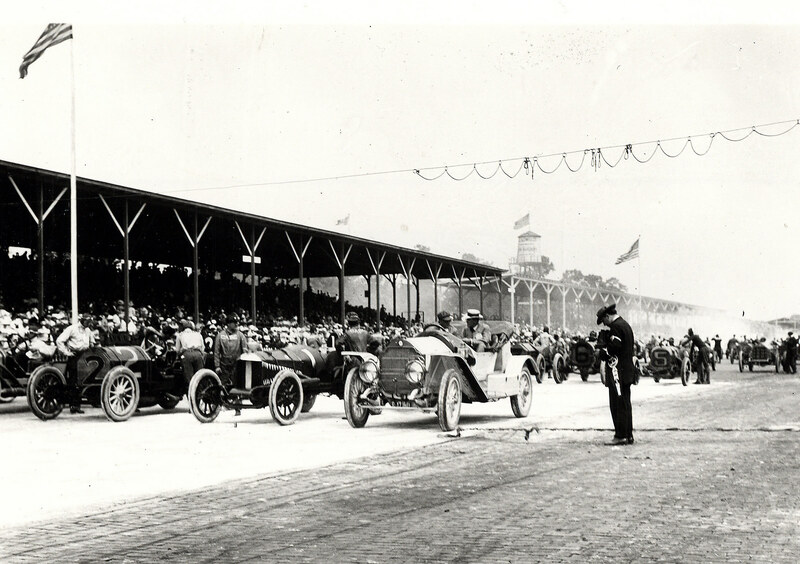 Cars lined up for the parade lap of the 1911 Indy 500. Note the grandstands matches the above photo. The bricks of the Indy 500 track. Another mystery: Why was a faded #5 on the front of the Alco? Did the Alco race as #5 in an unrecorded race before or after the 1910 Vanderbilt Cup Race? This is a link to the known racing record of the Alco Black Beast. Note prior to the 1910 Vanderbilt Cup Race, the Alco raced in Indiana for the Elgin National Trophy Race on August 27, 1910. 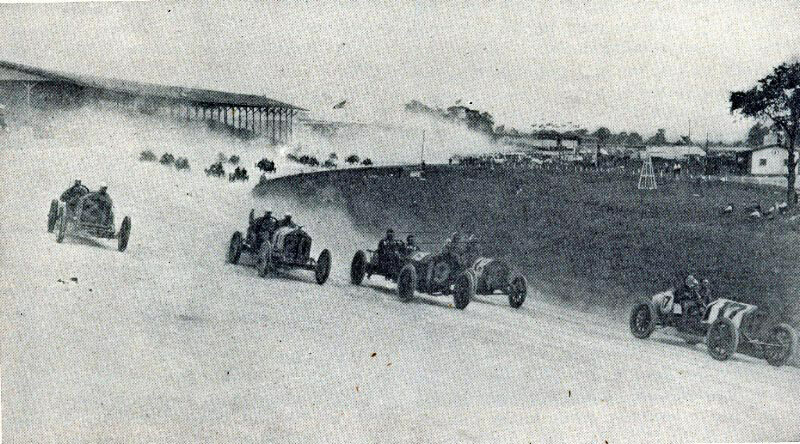 Following the Elgin race, a series of races were held at the nearby Indianapolis Speedway. 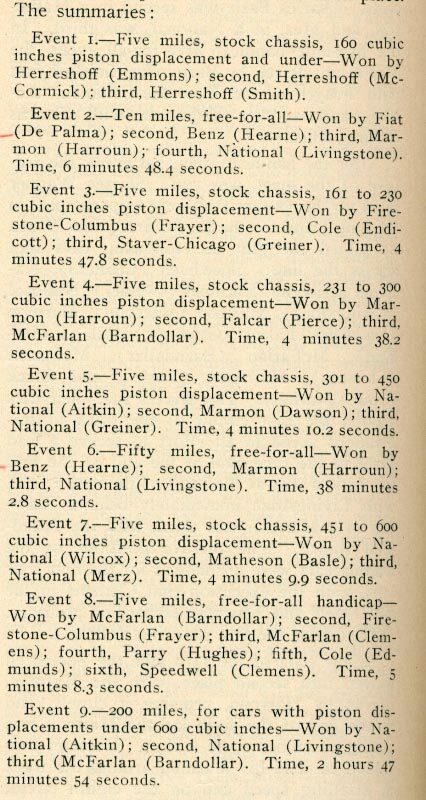 As seen in the race results published in the Automobile Topics, the Alco did not compete in either the September 3rd or 5th events. However, as suggested by Ariejan Bos, it may be possible that the Alco practiced on the Indy track prior to the 1910 Vanderbilt Cup Race to be held on Long Island on October 1, 1910. 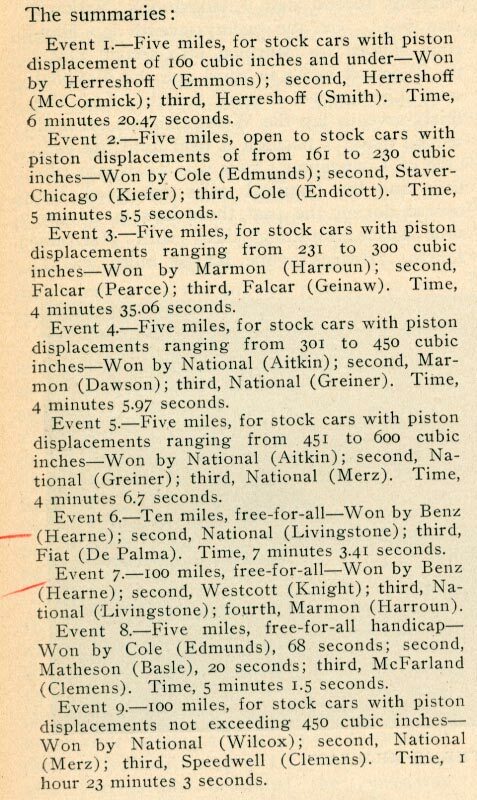 After resporting the September 1910 results, Automobile Topics published this article annoucing the race that would become the first Indy 500. To add to the confusion, this is official Alco photo published for the 1911 Indy 500 race. Note the number 18 on the hood matches the Mystery Foto. 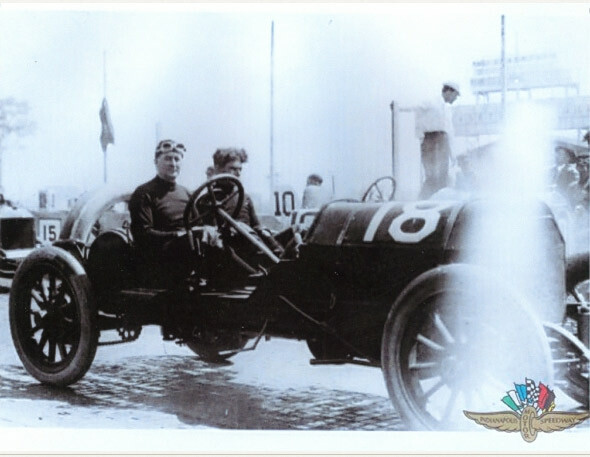 Is it possible that this photo was taken in September 1910 at the Indy track before running as #18 at the Vanderbilt Cup Race. As commented below by Greg Oreiro,the Black Beast's first race after the 1910 Vanderbilt Race (October 1, 1910) and before the 1911 Indy 500 (May 30, 1911) was the 1911 American Grand Prize held on November 12, 1910. The Alco raced as #7 and finished 12th in a field of 15. Leaving the race after 11 laps due to gear failure. 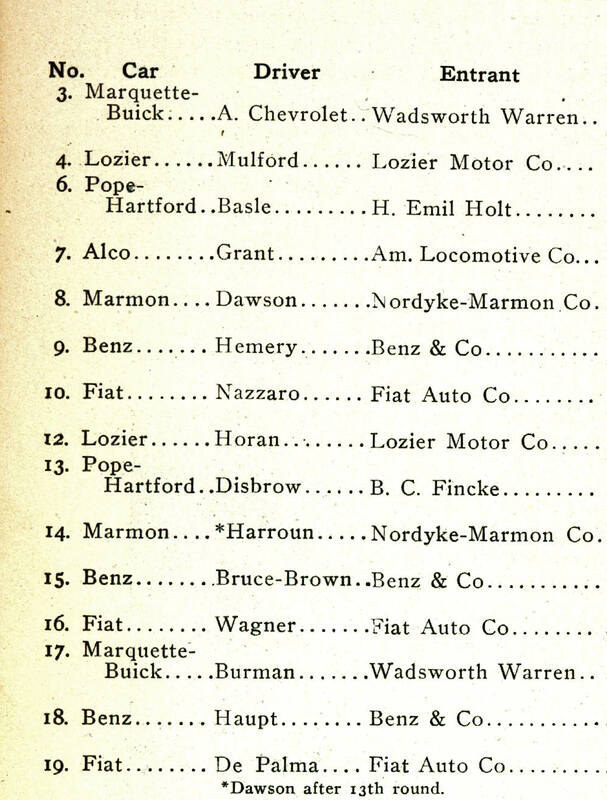 Entrants in the 1910 American Grand Prize. 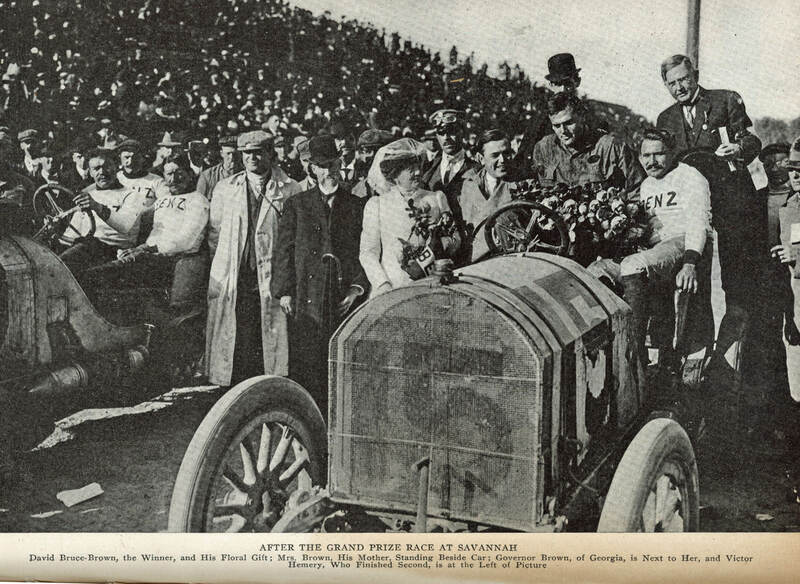 The race was won by American David Bruce-Brown in the #15 Benz. Trade journals published this photo of the #19 Alco on race day during the parade lap. This is the only known film of the Alco during a race. 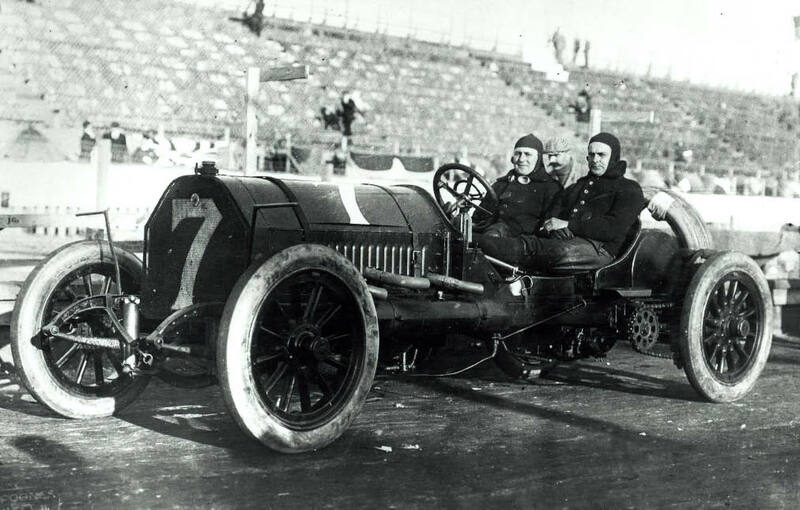 Unless I’m way off base, it sure looks like Harry Grant along with mechanician Frank Lee driving the Alco Black Beast during a test run prior to the first Indy 500 in May, 1911. The brick roadway helped with the track ID. Indianapolis Motor Speedway- Gotta be the bricks! Of course the grandstands help with an ID too. Harry could use some new Non-Skid tread tires. Interesting shocks originally used. All I can get out of this is that It’s #18 and looks like Hempstead Plains by the way the grandstand looks. The race I think was in 1910 on Oct 1. As for the driver and mechanician,this I"m not sure of either Grant and Lee and I also think they won the race. I might of mixed it up with another race. Probably batting O aren’t I? It is obvious an Alco at Indianapolis (recognizable by the bricks and the grandstands). Probably we see the Alco before the Inaugural 500 Mile Indianapolis race, held in May 1911. The driver is of course Harry Grant. 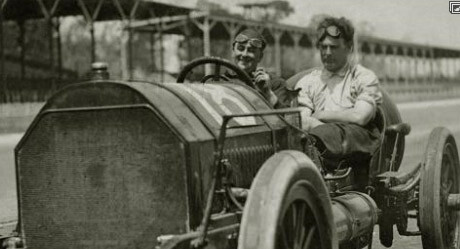 The mechanician is Frank H. Lee, who joined him in both Vanderbilt Cup races of 1909 and 1910. During the Elgin National Trophy in August 1911, Lee would drive an Alco himself, and Geo Babcock would join Grant (in his last race for Alco) as mechanician. 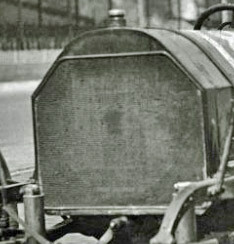 The number 18 apparently is a remnant of the 1910 Vanderbilt Cup race, because the Alco wore number 19 during the Indy race. The curious thing is that there is an official photo from the Indianapolis Motor Speedway circulating with the Alco wearing number 18 . This photo shows a kind of starting line up, is clearly shot at Indy (the bricks! ), but it cannot be the main event because of the number18 (Eddy Hearne on Benz had this number)!? 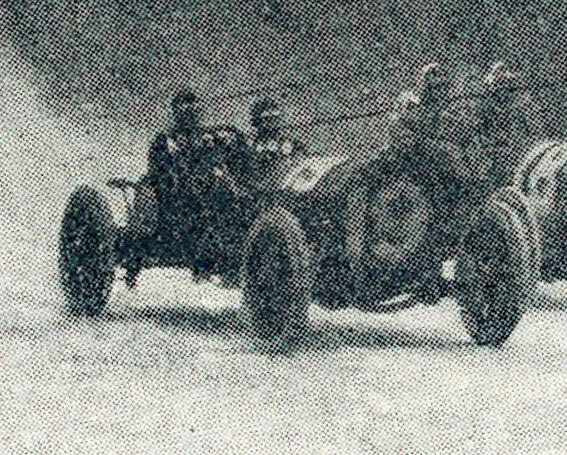 My guess for the date was based on the ALCO racing first in the Cobe Trophy Race, Indianapolis, Indiana, July 4, 1910, as car #27, and then as car #6 Elgin National Trophy Race, Elgin Road Race Course, Indiana, August 27, 1910. I noticed that faded 5 on the radiator also, and it threw me off a bit at first. (Maybe it could have been a radiator from another race car?) But that photo’s caption asks; “Did the Alco race bewteen October 1910 and May 1911?” and there’s where my confusion is, I didn’t assume the photo was practice for the 1911 Indy 500 because according to the Beast’s bio page on VCR, the ALCO raced as car #7 in the American Grand Prize, in Savannah, Georgia, on November 12, 1910. Wouldn’t the ‘remnant’ number left on the car from the previous race be a 7 and not the 18? 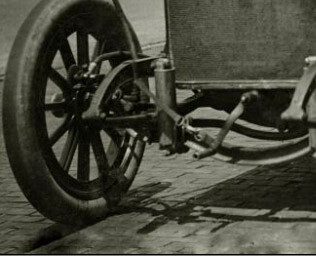 Further looking at the photos of the car from 1910 VCR and Indy…Are the car numbers removable panels between the hood straps and not the car itself? That would explain my confusion. It would have been easy to remove the protective radiator grill and quickly swap numbers on the hood while at Indy for photo ops. Greg, I am impressed. You have raised some great points. I have revised the post above based on your comments. Logically, it makes sense that the Alco Black Beast may have been practicing for the Vanderbilt Cup Race on the Indy track in September 1910. It raced in Elgin, Indiana on August 27, 1910 (as #6). It also does not make sense that the racer would have the #18 on its hood in May 1911 since its prior race on November 12, 1910 it ran as #7. My best guess is the official Alco photo used for the 1911 Indy 500 Race may have been taken while the car was practicing in September 1910. Accordingly, I now agree with your original answers to the Mystery Foto! Kudos!!! I must admit that I completely missed the American Grand Prize. After reading your comments I thought that maybe there was a second car. However the resemblance between the AGP car and the Indy mystery car is so strong, that they must be the same car. It puzzled me why this car would practice at Indy until I realized that Indianapolis was on the way between Elgin and Long Island (or the factory at Providence). They had been at Indy in July for the Cobe Trophy and passed there of course again after the Elgin race. 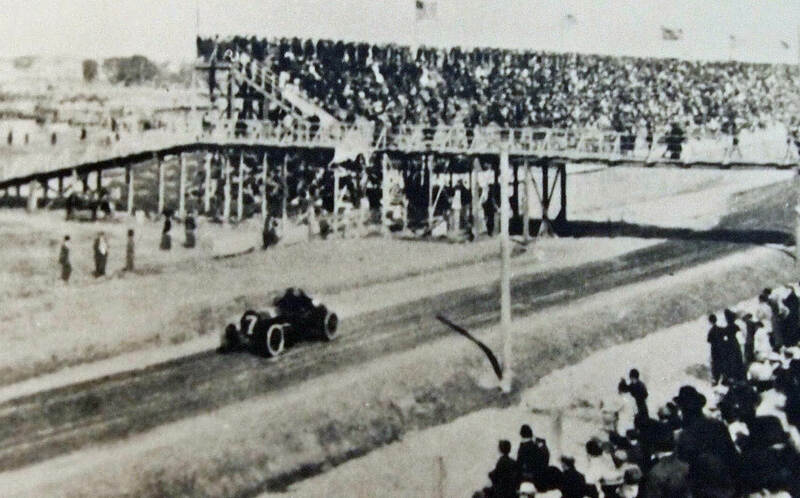 On September 3 and 5, 1910 races were held at Indy and there was a nr. 10, Joe Dawson on Marmon. On the official Indy Alco photo you can spot the number 10 on a shield at the back of a car, comparable with Harroun’s number shield on his Marmon in 1911. I do not know how long in advance the starting positions for the Vanderbilt Cup race were known, but apparently already early September. In my opinion the frontal number was painted on the radiator protection shield, which is absent on the mystery photo. So it is my impression now, that they were at Indy early September on their way back to Long Island and were photographed there during the race weekend, just as guests, not as competitors. They were of course famous already after their first Vanderbilt Cup win. Anyway, Howard, thank you as always for keeping us busy! I have another possible theory about the faint #5 on the radiator. In the Lowell Trophy Race, in Massachusetts, on September 8, 1909, The ALCO was #5. In that race, the ALCO did not use the protective grill in front of the radiator and it appears to be the only race from what I see that the ALCO did not use the grill. The number was painted directly on the radiator itself unlike all others where the number was painted on the grill. The faded numeral seems to be the same size and similar font as the black 5 from the Lowell race in 1909.